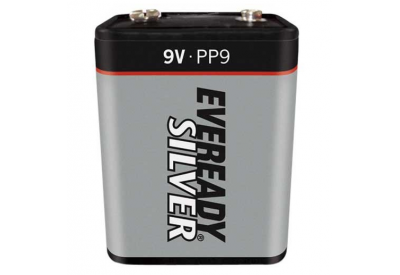 The Eveready Silver 9V PP9 Battery is your traditional 9V battery. This carbon-zince specialist battery from Eveready was widley used in class lanterns and radios. 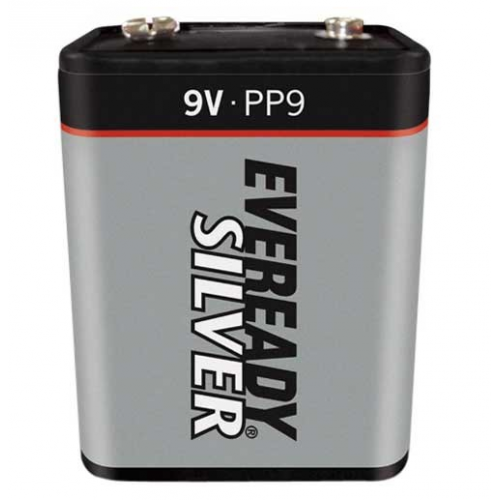 While it is a 9V battery with a rectangular case, it is NOT to be confused with the much smaller PP3 9V cell. Also known by its IEC designation of 6F100, this battery is considerably larger and heavier. The battery case measures 645mm wide by 80mm high by 51mm deep. The cell has a nominal capacity of 5000mAh.